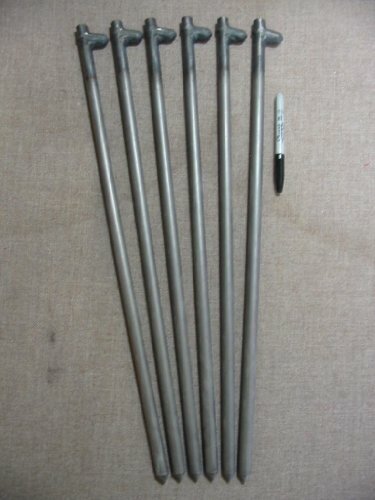 This is a six pack of super heavy duty steel tent stakes. These stakes are 24 inches long and made from 5/8 diameter alloy steel. Plastic stakes break the first time. Sheet metal stakes are not much better. These stakes are not even in the same class. You grandchildren will still be using these stakes long after you are gone. There is no other stake on the market today that will compare to this one. We manufacture these in East Tennessee using skilled metal workers. Machined point for easy driving. Forged rope hook head stops rope slippage. If you have any questions about this product by Monk Industries, contact us by completing and submitting the form below. If you are looking for a specif part number, please include it with your message.